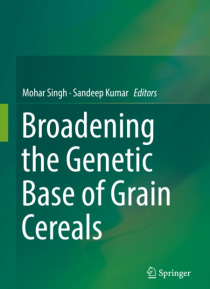 This book offers comprehensive coverage of important grain cereals including their origin and distribution, crop gene pool, level of diversity, production constraints, traits of importance for genetic base widening, crop improvement methodologies, genome mapping, genomics for breeding, and future strategies. The chapters, contributed by eminent crop researchers from around the world, provide rare … insights into the crop-specific constraints and prospects drawing from their substantial experience. As such, the book offers an essential source of information for grain cereals scientists, teachers, students, policy planners and developmental experts alike.Grain cereals, which comprise rice, wheat, maize, barley, oats, sorghum and millets, are members of the grass family. These crops are vital to human nutrition, thanks to their roles as staple food crops in different parts of the globe. Some of them are rich sources of carbohydrates, which provide energy, while others are important sources of minerals, vitamins and proteins, in addition to their medicinal properties. In most cereals, the existing variability among elite germplasm has been exploited to attain a desirable level of productivity. However, to make further breakthroughs in enhancing yield and improving stability in future crop cultivars, new sources of genes/alleles need to be identified in wild/weedy species and incorporated into the cultivated varieties. Though there have been many publications on various aspects of grain cereal improvement in the recent past, to date this essential information has remained scattered among different periodicals.